The Comment to Canon 2 of the Code of Conduct for United States Judges defines appearance of impropriety as follows: “An appearance of impropriety occurs when reasonable minds, with knowledge of all the relevant circumstances disclosed by a reasonable inquiry, *would* conclude that the judge’s honesty, integrity, impartiality, temperament, or fitness to serve as a judge is impaired.” (Emphasis added). Ironically, that is a lesser standard for disqualification than is required under the Federal Disqualification Statute, 28 U.S.C. § 455, and under the Due Process Clause of the Constitution. The following is adapted from Understanding Lawyers’ Ethics (3d ed. 2004). Nevertheless, there is a tendency for some judges and commentators — and particularly for advocates opposing disqualification — to slip away from the statutory language, turning “might” into “could” or “would.” The differences are important. The word “might” is used to express “tentative possibility;” “could” is used to express “possibility;” while “would” connotes what “will” happen or is “going to” happen. Accordingly, the word “would” requires significantly more than a tentative possibility of doubt regarding a judge’s impartiality, and use of the word “would” therefore produces a subtle but substantial change in the meaning of the statute. For example, when Justice Stephen Breyer was nominated for the United States Supreme Court, I argued against his confirmation. The reason was that Breyer, when sitting in the First Circuit, had written an opinion that could well have had a devastating impact on Breyer’s own financial well-being. I maintained that Breyer had therefore acted unethically in failing to recuse himself. Then White House Counsel Lloyd Cutler contended that reasonable people differed about whether Breyer’s impartiality in the case was questionable, and that Breyer therefore was not required to recuse himself. That argument would have had force if the statute required disqualification only when a reasonable person *would* question the judge’s impartiality. In that event, if reasonable people disagreed about whether the judge’s impartiality is questionable, one could not say that a reasonable person *would* question it — only that she might or might not — and recusal would not be required. Under the statute, however, if reasonable people do disagree, then clearly a reasonable person might question the judge’s impartiality, and recusal is required. That is, under § 455(a) a federal judge, or justice, can properly stay in a case only if no reasonable person *might question* the judge’s impartiality. 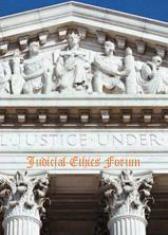 The Judicial Conference of the United States has (gently) amended the Code of Conduct for United States Judges. The revisions, inspired in part by the 2007 Model Code of Judicial Conduct, can be found here and will take effect on July 1, 2009. It has been reported in the press that the new federal code contains for the first time a definition of the appearance of impropriety. To be sure, the new code does contain a definition of the appearance of impropriety: “An appearance of impropriety occurs when reasonable minds, with knowledge of all the relevant circumstances disclosed by a reasonable inquiry, would conclude that the judge’s honesty, integrity, impartiality, temperament, or fitness to serve as a judge is impaired.” Code of Conduct for United States Judges Canon 2 cmt. (2009). The “old” (but currently in effect) code, however, contains a similar definition: “The test for appearance of impropriety is whether the conduct would create in reasonable minds, with knowledge of all the relevant circumstances that a reasonable inquiry would disclose, a perception that the judge’s ability to carry out judicial responsibilities with integrity, impartiality, and competence is impaired.” Code of Conduct for United States Judges Canon 2 cmt. (2000). To me, the juxtaposition shows that the only significant change is the explicit inclusion of “temperament” in the test for the appearance of impropriety in the new code, but that trait certainly is not “new” to impropriety analysis. The new definition also omits the word “perception,” which arguably dilutes a true “appearance” standard.